Like most wedding photographers, we shoot/edit our last wedding of the season and collectively take a big breath and know that we’ll get a couple of short months “off” to recharge. I use the term “off” loosely, because any business owner knows that even in your “off season” you’re still really busy. We might not be shooting multiple days but we certainly have A LOT to keep us going. We’ve finally decided 2015 is the year to tackle some house projects and renovations! A few years ago we did the front yard, which was a huge change….but never did anything inside the house. The Hubbs and I have been in our home for about 7 years now, and sadly, it looks very much like it did the day we moved in. Our friends like to tease us that we moved in and haven’t done a thing since! I should preface that by saying the previous owners did a great job with decor, and so it looked like we didn’t even need to DO anything. We even opted to include some furniture in the sale which made life a little easier. Aside from hanging some photos on the walls….that’s about it! This past summer we slowly started getting our ducks in a row so to speak, and decided we were for sure going to tackle the Master Bath Renovation. Rob has been promising me since we bought this house we’d re-do the master bath, and it just never happened. As often….life and work (and money!) get in the way! Our friends joke endlessly about how we bought a brand new towel rack set (you know, the towel, hand towel, and toilet paper holder?) when we bought the house and 7 years later it’s never been hung because as Rob would say “there is no sense in hanging it if we’re going to redo the bathroom”. Y’all….I’m Not.Even.Kidding. 7 years with no towel rack!!! Despite having already ordered and had delivered ALL the stuff needed for a complete demo and renovation on the bathroom, we got a wild hair that instead we’d start with our dining room. When we moved in, I loved the dining room. Of course I did, it was already finished – complete with art and a table…haha. Many years later I can’t stand it and was itching for a change. Enter Pintrest. I have a love/hate relationship with Pintrest, but for house projects it’s been my best friend. 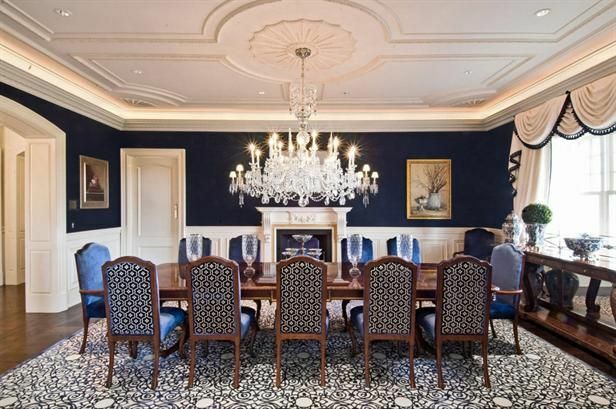 Granted, my dining room won’t seat 12, nor does it have room for a five foot chandelier…..but a girl can dream right? Already having a chair rail in there, we’ve started on the road to renovation with wainscoting currently being added. The next step is wallpaper removal and painting! Now if we can just agree on the shade of Navy to go with, we’ll be all set! We’ll be finishing the room off with a new dining room table…one that won’t show every smudge known to man! Can’t wait to share more of the progress! Courtney Hathaway is a Destination Wedding Photographer based on the Outer Banks of North Carolina. For more info on booking Courtney for your wedding or portrait session, please visit the main website at www.courtneyhathaway.com. It’s hard to believe another year has come and gone! 2014 was such an amazing year for us here at CHP, and 2015 is looking like it’s going to be even better! Did you get engaged his Holiday, or ring in the New Year with some New Bling?? We’re currently booking for the remaining of 2015 and would LOVE to chat with you about your wedding!